In February this year, Google implemented an update that removed ads displaying on the right hand side of results pages from desktop searches, discussed in our blog; Google removes sidebar ads. How does it affect PPC & SEO? The change meant that up to four ads at the top of the page and an additional three at the bottom of the page are now being shown versus the 11 ads shown before the update. This equates to around 36% fewer opportunities for your ads to be seen, but on the flipside an additional paid slot was opened up at the top of the page (where the most clicks come from). These changes, amongst others, have come about as part of Google’s response to 2016 being the ‘year of mobile’, as the number of mobile searches made each month finally overtakes desktop searches. Google is trying to create a similar user experience across both desktop and mobile. Not surprisingly, such a significant change to results pages wasn’t going to go unnoticed by those in the Search industry and as an expert search marketing consultancy, the team at B2BML has analysed all the repercussions both in PPC and SEO that you need to be aware of. What has happened in PPC? Prediction: With fewer ads being shown on each results page with the removal of Google’s sidebar ads it seemed logical that the number of impressions each ad had per day would drop. Actual: Somewhat surprisingly, we’ve seen improved impressions across our campaigns since the change. It seems our campaigns are bucking the trend as other experts, such as Click Convert, have seen impressions decrease. We can only conclude that this is the result of the extensive research that goes into the setup of our campaigns to ensure our Ads target a wide range of keyword opportunities, whilst always remaining relevant to the client’s website. Prediction: As with impressions, we also expected a drop in average position for campaigns that didn’t adjust their budgets to counteract increased competition on the page due to there being fewer ad slots. Actual: However, average ad position has remained stable and strong in our campaigns. We put this down to the quality of the ads we produce - by ensuring a high level of relevance to the keywords they target and a high quality score, a high average position can be maintained without the need to increase budgets. Prediction: Back in February, we expected well-managed campaigns to see improved Click-through-rates (CTR), as there are now four ads at the top of the page. An extra slot in this prime location for attracting clicks gives your ads an extra opportunity to compete each time a search is made. Actual: After almost two months of close monitoring, we’ve concluded that campaigns that have enough budget to achieve ads appearing in the top four slots will see improved CTR across ongoing campaigns without having to increase budgets. Prediction: Back in February we were expecting higher CPCs, as fewer paid-for slots available on a single page of results would increase competition and drive up bids. Actual: Contrary to our predictions, we have actually seen a small drop in our overall CPCs. According to Search Engine Watch which also observed reduced CPCs, after extensive testing from Google it became apparent that very few people clicked on the ads displayed on the right hand side and that these clicks were only making up a very small proportion of total campaign spend. The addition of the fourth ad at the top of the page provides a lower cost position that users might actually click on, causing a slight decrease in average cost per click. The removal of Google’s sidebar ads came after extensive testing by Google, and the effects we’ve seen would imply that they found very few people were clicking on these ads anyway. Fewer ad slots on results pages have of course decreased impressions significantly, but we would always encourage marketers to look beyond impressions and judge campaigns on their conversions and ROI. The improvements in click through rate and cost per click for the campaigns we’ve been running mean that the removal of sidebar ads on the whole has been a positive step for PPC. What about you? Have you seen significant changes in your PPC campaigns? We would love to hear your thoughts. 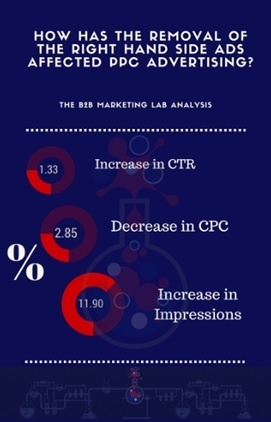 At the same time, if you are you are concerned about how this change has affected your campaigns, or are looking to get better results from your PPC spend, get in touch today with one of our PPC experts, or find out more about the B2B Marketing Lab’s B2B Pay Per Click services. Share with us on Twitter at @B2BMarketingLab! !